I agree that the mat cutting aspect is pretty easy and that tool (or similar) is all you need if you are going for standard pre-built frames. I usually also use a sheet of acid free paper as backing to stick corners on... oh and you are going to want to search online for clear UV protection plexi (don't go for anti-glare unless you are framing posters or something you are wanting to lay the plexi directly onto without a mat, anti-glare does not present with good clarity if it isn't laid directly onto what you are framing). I always seem to lose the motivation to do more because I know I will buy more and then want to plan a different layout. So I put it off. My problem could probably be best solved by having shelves for my frames but I know that my family will either end up knocking everything over or complain about being constantly paranoid about knocking everything over (as my art is mostly in a stairwell). Going to have to settle for command strips https://www.amazon.co.uk/dp/B004051TE2/ref=asc_df_B004051TE258710440 and put up with buying new each time I rearrange. He was in the UK just over a year ago https://www.comicartfestival.com/news/sergio-aragonés-heads-kendal-present-first-ever-sergio-aragonés-international-award , seemed perfectly with it, wouldn't think he is slowing down. Well I got a reply 11 days ago saying he was working through over 400 orders and he would get to me when mine was the next one in the list. Unfortunately for me I want something unrelated to the sale or cons but it just so happens to be that time of year. Go and look at what is listed here. You have a massive lot of recent results to draw your own conclusions from. Things are a bit all over the place, but you might find a high/low dollar value across those examples: http://www.comicartshop.com/forsalesearchresult.asp?Page=8&txtSearch=&selOwner=75&TimeSpan=&Order=Date Would it BIN somewhere in the middle at $450? Probably. There are over 1150 pages for sale via Charlie's rep at source and fairly decent panel pages with action are $725 - $1250, so the secondary market is more bang for your buck. Would it do better or worse on any given day as a no reserve auction? Errr... you just need enough interested bidders not to whiff :P The comic connect auction was really well promoted so it won't always follow that eBay will get you the same attention on BIN. Have seen some decent ones relisted multiple times without sale. The page your friend has is certainly a memorable one and a really good example of what made the early story so gripping. Also kind of but not really a "death of" page as it happens across several pages. I don't see why it wouldn't get a reasonable amount. A bit too gruesome to put on the wall IMHO. Removing overlay...is it a bad idea? I have a piece that had an additional full page stat attached to the front with notes and instructions on it. I just carefully peeled back the tape and stuck it to the back instead, it seemed like the easiest option in my case. Best of 2018: BUDGET EDITION - Now Open for Entries and Voting! 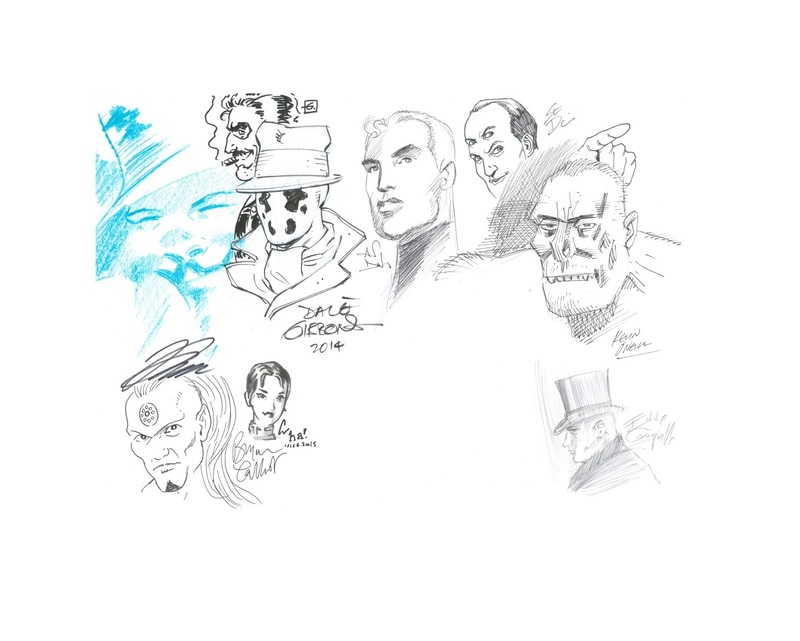 I didn't really add much at all in 2018 so I'm just going to stick with an unpublished con sketch https://www.comicartfans.com/gallerypiece.asp?piece=1505749 Love the stuff that has been posted in this thread, it's encouraging to see the quality of the pieces from the shallower end of this hobby just from the last 12 months. Time can be what it is all about. Time for an artist to do more than one book, time at home, time for self improvement... I can't recall if it was this forum where I said this before but nowadays a lot artists who choose the academic route are getting tooled up to work digitally because it gives them much more choice in the workplace. Character design, scenery design, concept artist, texture artist, prop design, 2D, 3D, etc etc. I think we are going to see a lot more digital art creep in purely because of the choices it offers artists. Short answer is I totally agree with Bronty on this. There are comics that I read as a young child which had high circulation but I don't have any interest in collecting the pages or covers I see on eBay from time to time. ...the earliest comics I want to collect are the ones that gave me a unique or what was then a "new to me" experience. It made them stand out, and in general I guess it started with comics that sometimes had a darker storyline. As an example Batman comics weren't the same as the TV series or cartoons I had watched. People didn't die or get damaged on screen, so I never got all that invested in them. Whereas comic writers would happily slap me in the face by showing me they could just as easily take away a character I loved as create one. Oh boy... Vertigo comics. If you have a lot of them to catch up on they could make you very poor. I kinda feel bad that I was actually waiting for this one. Love it now though. It has just as much (if not more) flavour than everything else.... tasty thread. Yay. I can play... #10 of Badger - First appearance of "Hodag", and as the Badger hails from Wisconsin it seems fitting that his nemesis draws on the local folklore https://en.wikipedia.org/wiki/Hodag . I have always wondered how relevant that reference is in wider America? I do have more obscure bit part players in CAF and some I haven't popped on there but thought I would go with one that at least had several appearances under his belt. I also like that this thread is cropping up a few unusual sketches. If I had to pick an unusual one from what we have then it's the one that my daughter got from Carlos Ezquerra of Fionna the Human (which is from Adventure Time universe, more specifically it's from the gender bent fan fiction universe that exists within the Adventure time universe). Everyone was glad that she had brought some reference for Carlos to look at . I just really really like it. Just popped on here before catching some sleep. I don't think I can get my head around this one, have already typed a post and deleted it several times.